Vineeth Sreenivasan (son of actor-writer-director Sreenivasan) made his debut in films as a singer, then went on to act and then write and direct. In Oru Vadakkan Selfie he is writer, lyricist, singer and actor. The director is his long time associate G Prajith. 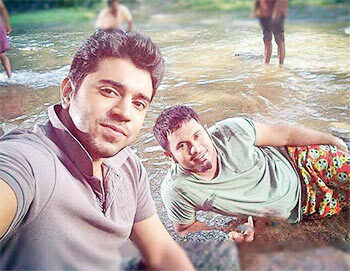 Vineeth shares the screen with his trusted friends Nivin Pauly and Aju Varghese. The story is set in an engineering college, where the good for nothing Umesh (Nivin Pauly) is studying. He has failed in virtually every exam and has to attempt a supplementary examination. He feels that film-making will be the easiest way to become rich and famous and wants to assist none other than Gautham Vasudev Menon. His friend Shaji (Aju Varghese) suggests that he make a short film and upload it on the internet. But the result is utter failure. Umesh’s father (Vijayraghavan) orders him to help him to run his small shop. To avoid such a bleak future, Umesh catches the next train to Chennai. Daisy (Manjima Mohan) is his new neighbour in the city. He lies to his friends that they are having an affair, tricks her into posing for a picture with him, and sends it to Shaji. It takes him a few days to realise that he is not cut out for the struggle to enter the film industry, and he returns home. Only to find that his hometown is hot with news of his elopement with Daisy! He returns to Chennai immediately with Shaji to find her and prove his innocence. From here on the film industry is left aside and the story enters a totally different dimension. Vineeth Sreenivasan himself makes an appearance as a private detective to help Umesh and Shaji to trace Daisy. As the story moves forward, one gets the feeling that Vineeth has taken the residue of his film Thira (2013) – in which Shobhana appears as a superhero fighting human trafficking - and given it a comic tone. The story now focuses on how scoundrels use the social media to trap innocent and lonely girls and swindle them of huge amounts of money. The narrative has some gaping holes, but one can ignore them as the subject is not dealt in a serious or profound manner. Nivin Pauly’s purple patch continues to expand with every film. Here he does not have to be that intense. Aju Varghese consolidates his position as a comedian with a performance that could be described as rocking. Neeraj Madhav the third part of the triumvirate of friends is impressive. Manjima Mohan does not require something special to be the leading lady of this film. Oru Vadakkan Selfie is a fairly enjoyable film.